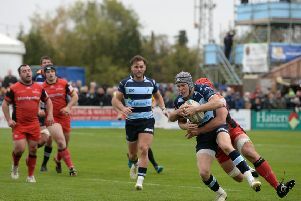 Bedford Blues continued their preparations for the Greene King IPA Championship season with a seven-try 45-18 win over Plymouth Albion at Brickfields on Saturday evening. There were two tries for Pete White, along with one apiece for Myles Dorrian, George Perkins, Hayden Thompson-Stringer, Jordan Burns and Camilo Parili-Ocampo. Albion took the lead early on with a well-struck Bill Searle penalty before the Blues kicked into gear with two tries quick-fire tries. White scored from close range having been played in by Joel Conlon before Dorrian took advantage of some lacklustre defending to score under the posts. The Australian converted both to make it 14-3. Albion soon hit back though with a try from Seti Raumakita following some good work by Ethan Ford who unfortunately picked up a knock during the build-up. The Blues regathered quickly, though, and George Perkins picked up a try on his debut when he was able to gallop through the home side’s defence almost untouched. Dorrian missed the conversion but Searle took the opportunity to reduce the deficit when he chipped over another penalty to make it 19-11. The Blues continued to look dangerous in attack, though, and when the opportunity presented itself again, White dotted down from close range with Dorrian adding the extras to make it 26-11 at the interval. Bedford made 14 changes at the interval, with only Ollie Dodge remaining, and it took 10 minutes for a fifth try to arrive when Thompson-Stringer went over following a 5m catch and drive. A few minutes later and it was 38-11 when Burns spotted a gap, took a quick tap penalty and went straight through to score with Jake Sharp adding the extras. There was time for Albion to add a second of the afternoon when Cameron Setter forced his way over from close range, with Tom Putt converting to make it 38-18. But the last try of the day was to be Bedford’s as the forwards worked hard following a line out and Parilli-Ocampo popped up with the ball which Sharp put over the sticks to wrap up the win. Scorers: Albion: Tries: Raumakita, Setter; Con: Putt; Pens: Searle (2). Bedford: Tries: White 2, Dorrian, Perkins, Thompson-Stringer, Burns, Parillio-Ocampo; Cons: Dorrian (3), Sharp (2).